Glenn E. Paxson, age 87, of Webb City, passed away Thursday, November 29, 2018. He was born May 23, 1931 in Webb City. He began his career at age 15 working 3 ½ years in maintenance for a mining company. He then worked evenings at Webb Corp Wheel Division five years. During this time he also hauled coal in Kansas and hauled ice from Carthage to Webb City. He was an electrician for all three powder companies, Dupont, Atlas and Hercules, and worked for 20 years in maintenance for Cardinal Scales. 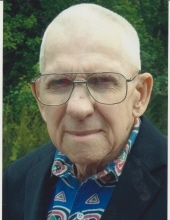 Glenn served 39 years as Webb City Electrical Inspector. He also worked several years as a maintenance consultant for the Webb City R-7 School District. Glenn attended First Baptist Church of Webb City. He is preceded in death by his mother, Myrtle (Bane) Paxson and brother, Leonard Paxson.Graveside service will be held Tuesday, December 4th at 2:30 at the Mount Hope Pavillion in Webb City. Memorial contributions can be made to the First Baptist Church of Webb City or a charity of your choice. Please visit www.simpsonfh.com for online condolences. Arrangements are under the direction of Simpson Funeral Home in Webb City. To send flowers or a remembrance gift to the family of Glenn E. Paxson, please visit our Tribute Store. "Email Address" would like to share the life celebration of Glenn E. Paxson. Click on the "link" to go to share a favorite memory or leave a condolence message for the family.